This semester of reporting has been an amazing experience. Having a neighborhood blog not only helped my reporting skills, but introduced me to an incredible neighborhood, Hayes Valley. I had never been to Hayes Valley, but now I truly adore the area. The shops are great and the food is to die for! Already, I have brought my friends and family to visit the neighborhood and I, myself, plan on visiting soon. I really enjoyed making this blog and providing a resource that’s easy to use for locals and tourists alike. I have to say that I don’t enjoy news writing so the pieces on crime, trials and other news related articles were especially difficult for me. However, I think that these skills are essential and will be beneficial to me throughout my career. 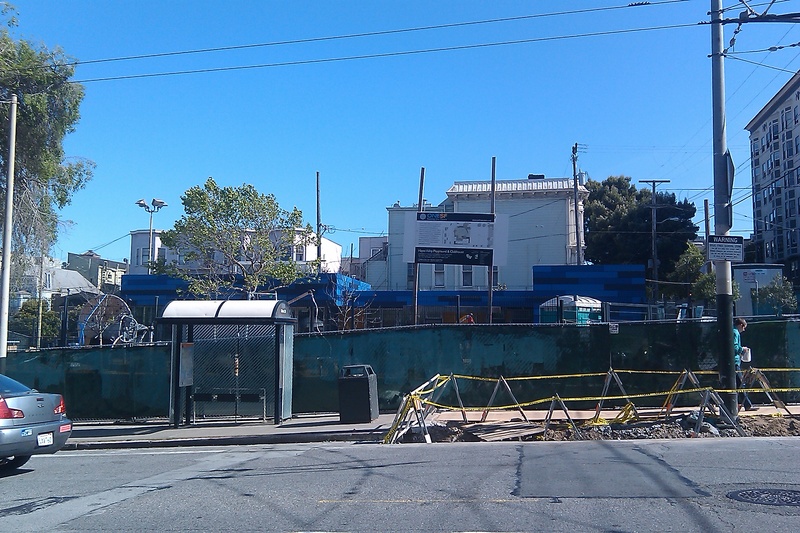 My final story, on the redevelopment of Hayes Valley, was very interesting to write about. I can’t wait to see what else springs up in the neighborhood. If I had to sum up my neighborhood experience, I learned that Hayes Valley is on the cutting edge of technology, trends, food and eco-friendly solutions. The community truly takes pride in their neighborhood. Thank you to all the merchants, residents, visitors and community leaders who assisted me in putting together this blog. This is Ivanna Quiroz, San Francisco State Journalism, signing off. Coffee lovers, listen up! 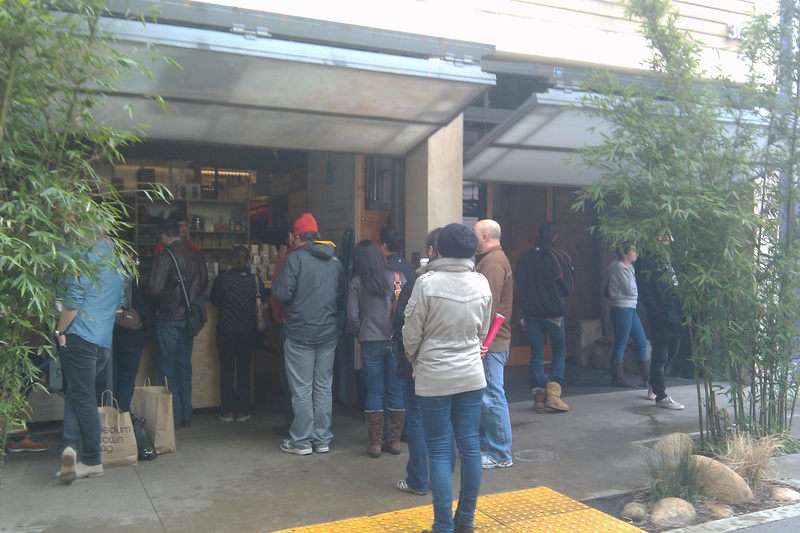 Blue Bottle Coffee Kiosk is one of the best places in Hayes Valley to get a great cup of coffee. The name of “Blue Bottle” was inspired by Franz George Kolshitsky, who opened Central Europe’s first coffee house in Vienna; he called it “The Blue Bottle.” Offering organic, eco-friendly cofee in Oakland, San Francisco, and Brooklyn, Blue Bottle Coffee Company has gained an eclectic and loyal group of followers. The kiosk is located in the Linden St. alley in a cozy booth. Blue Bottle was able to transform a dark and smelly alley into a pleasurable spot making a great addition to the neighborhood. The area has some places to sit and relax surrounded by a few bamboo trees. While they do sell their coffee beans at the kiosk, the amount and variety of baked good is limited. When in Hayes Valley, this would definitely make a good rest stop. Savor every drop. M-F 7-5:30 or 6, Weekends 8-5:30 or 6, depending on the season. 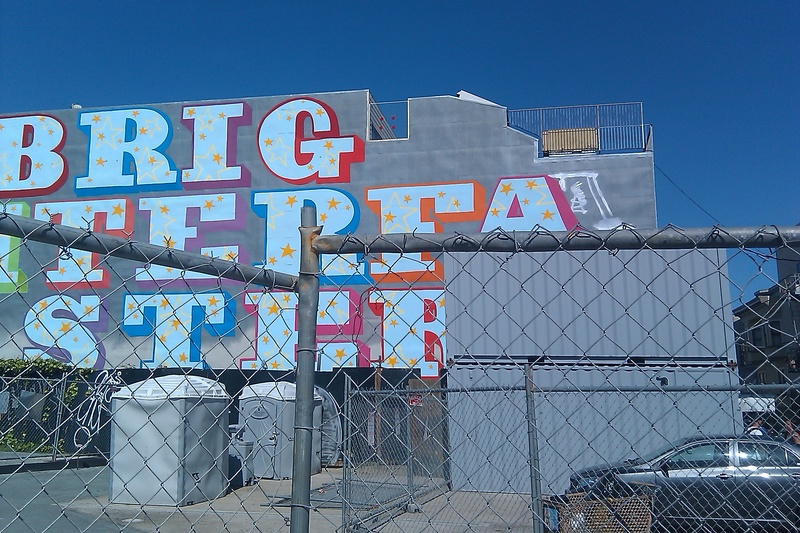 What can you expect to see in the Hayes Valley district? Hayes Valley has so much to offer locals and tourists alike from one-of-a-kind boutiques, comfy cafes, trendy eateries and community events. Here’s just a sampling of what you can expect to find in Hayes Valley. After several delays, Proxy opened Smitten, a made-to-order ice cream shop, on April 19. Located in a recycled shipping container on the corner of Octavia St. and Linden St., Smitten is the first step in Envelope A + D’s Proxy project. “I tried the vanilla mixed with some kind of ginger in it. It’s awesome, “ described Rob Webber, Room Service showroom manager. Smitten first began with Robyn Sue Goldman. Goldman created an ice cream machine that runs on liquid nitrogen. The machine, now called Kelvin, can make ice cream from scratch in about 60 seconds. Goldman took the machine on the road rolling the Kelvin machine on her Radio Flyer wagon. Goldman teams up with chefs to provide customers with fresh and seasonal ingredients, which means flavors will be constantly rotating based on what is in season. Some flavors that have already been featured are green tea, vanilla ginger, strawberry and salted caramel. 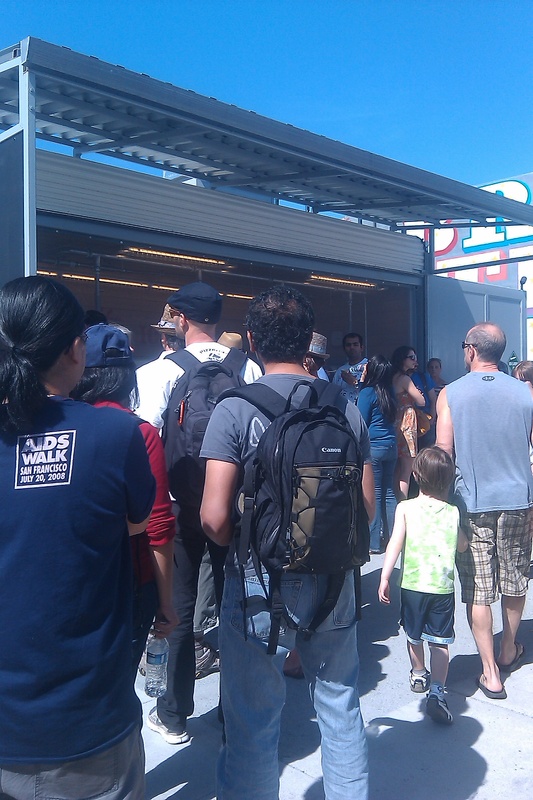 Today, Goldman has parked the wagon, adding a popular new addition to the Hayes Valley neighborhood and promising “truly memorable tastes.” The ice cream takes only 60 seconds to make, but expect to wait much longer as the lines tend to be long, especially on warm San Francisco days. Before the Loma Prieta earthquake, the freeway ran straight through Hayes Valley’s center and the neighborhood was abundant with criminal activity. Today, Hayes Valley is a completely different district that transformed after the earthquake and, with more redevelopment projects taking place in the neighborhood, Hayes Valley will undergo yet another transformation. Today, Hayes Valley is home to Hayes Valley Farm, the city’s famous Blue Bottle Coffee Kiosk and some of the best restaurants, cafes and boutiques in San Francisco, but it wasn’t always that way. Before the earthquake, the neighborhood was a hub for drug trafficking and prostitution. “Hayes Valley was mostly empty store fronts, especially the 500 block of Hayes, wedged between a freeway and one of the worst housing projects, between Buchanan and Webster,” said Russell Pritchard, co-founder of the Hayes Valley Merchants Association. According to the Hayes Valley Neighborhood Association, when the Loma Prieta earthquake damaged the Central Freeway running through Hayes Valley in 1989, the neighborhood began to see more business emerge. The area changed rapidly and revitalized the district. While the neighborhood has since then experienced major change, the earthquake left several empty lots. In January 2010, redevelopment took its first step when former mayor, Gavin Newsom, gave $50,000 and the interim use of an empty lot to create an urban farm, known today as Hayes Valley Farm. The farm will decrease in size over time to make way for new housing units and a temporary project called Proxy. The Proxy project, designed by Envelope Architecture + Design will include open space, an outdoor theater, a food truck court, various shops and art installations. “The city will rent one parcel to Proxy development for four years at $5,000 per month, and the other site for three years at $2,000 per month,” says Business Insider. According to Envelope Architecture + Design, the idea for the project was brought about when city officials realized that, with the economic downturn, these empty lots could be vacant for several years. Rather than have the lots remain empty and unused, the Proxy project will give the community a useful and entertaining public space while they wait for something more permanent. Proxy was conceived with the community in mind, creating public spaces that the neighborhood could appreciate. 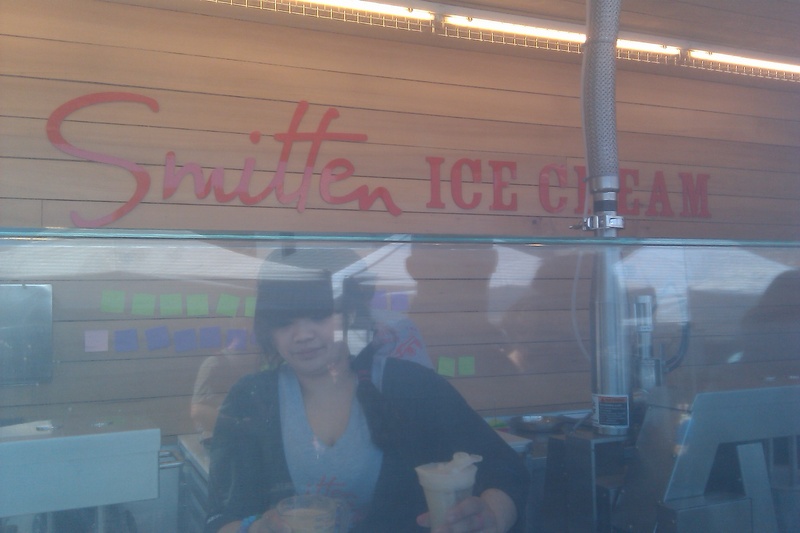 Already Smitten Ice Cream has opened as the first installation in the Proxy project. 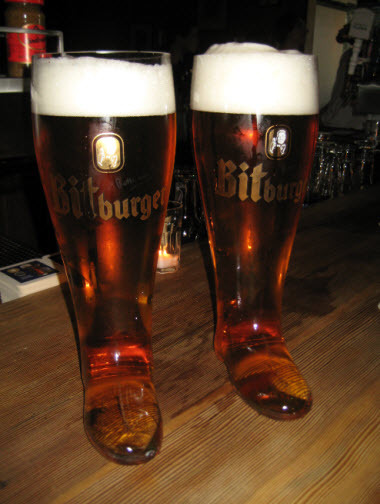 Other shops will include Suppenküche’s beer garden, Delfina’s wood-fired pizza oven, Ritual Coffee, and 4505 Meats. Another project underway is to transform Hayes St. into a two-way street between Gough St. and Van Ness Avenue. This plan is expected to slow traffic and create a better area for walkers, bikers and commuters. The Proxy project has experienced much delay but is expected to have most of the businesses ready by summer and the Hayes two-way street is expected to be ready in the fall. Hayes Valley is known for having some fantastic restaurants and cafes, but the neighborhood also has a unique shopping scene. This is a map of my personal favorite shops in Hayes Valley, in no particular order.